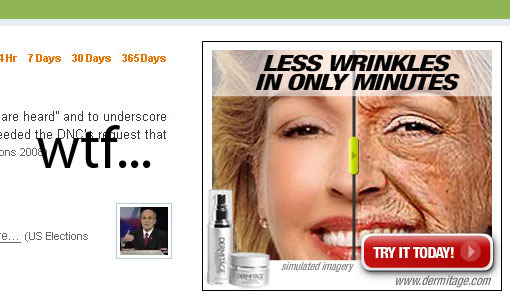 Now here's an ad that, shall we say, stretches the truth...oh just a wee bit. Not much else to say about it other than it appears on Digg which has had quite a few ads of questionable validity over the past few weeks or so. Bigger image here. According to The New York Times, Subway is inexplicably (as in pending lawsuit) pissed at Quiznos because of some "derogatory" user-generated videos that depict Subway unfavorably. Must see to believe (scroll down to view the big offender). Some actual Quiznos ads, depicting people on the street choosing between the two brands, also made it into the lawsuit, but the big stars are the UGC entries from some contest Quiznos ran. Subway is also suing iFilm for running the contest. 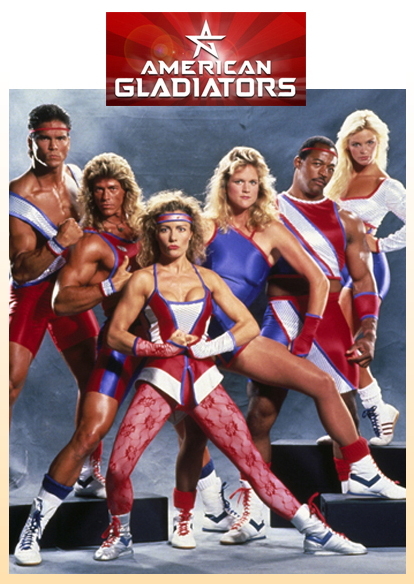 Tomorrow WhittmanHart Interactive launches American Gladiators, an online homage to the original series, to promote MGM's new American Gladiators. Old-school fans can find out where their favorite original Gladiators are today. (The revelations will probably be depressing.) Video of best hits and stunts will also be hosted. 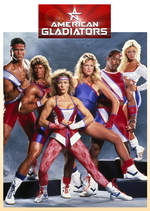 American Gladiators did something to our perception of adulthood as kids. We knew if there was even a small chance of wearing leotards and beating the crap out of people with giant batons on TV, there was nothing to fear about growing up. First Bacardi told us about the mysterious travellers of Murmansk Route. Then it said the mysterious travellers of Murmansk Route have something that will change our lives. To get it, all we have to do is bid for a locked suitcase on eBay. Not sold? Watch the video, which actually still won't win you unless you speak Spanish, and even then, odds remain 50/50. So here's an intriguing campaign for you transparency lovers. Strawberry Frog crafted a website for Brazilian lingerie company Universo Intimo, filled it with images of impossibly hot models...then added a blog on which a woman writes about how young girls can be demoralizing and create impossible to achieve expectations.Um, nice but huh? As part of her trip to the Philippines courtesy of the Philippine Tourism Department, HappySlip is advertising news of her Meet & Greet in Manila at the Mag:net Cafe this February 7. Get on the guest list at happyslip.yehey.com (Yehey! is the Philippine Yahoo!, kind of). The fun and games go down from 11am-3pm. Seeing as how this is for Philippine tourism and we want to put our best foot forward, it might be a good idea to filter the ads appearing at the end of the videos. Unless FilipinaHeart.com is a proud sponsor...? We always new Jay Mohr was an actor. We never really knew he was a comedian (we gave up on SNL long ago and, more recently, never watched Last Comic Standing). Apparently, appreciates his comic abilities and hooked up with him for a video contest called TaxLaugh in which entrants vie for a $10,000 and a chance to open for Mohr prize by submitting three minute comedy vids. Jay tells us, "Most people think doing your own taxes is hard and being funny is easy. We're out to prove them wrong. TaxLaugh will give comedians the chance to make a name for themselves by making people laugh about something no one likes - taxes." Match.com swears if in six months you don't live out a love story with someone from its site, you can have six more months of free service to make up for it. Not all tell-worthy stories end happily though. Sometimes you get locked out or hosed -- which, now that we think about it, isn't nearly as bad a fate as this one. Battering its usual "boo-hoo, we are too racy for Fox" shtick, GoDaddy sent us a celebratory pressie reading something like, "FINALLY, they've approved one of our deliciously naughty spots for the Super Bowl!" The ad features Danica Patrick. And while GoDaddy didn't send us a teaser for that, it did send us one for yet another rejected ad called "Exposure." It's supposed to be a spoof of "a certain pop culture celebrity phenomenon" and Danica thinks it's really funny (we suspect she's contractually required to). See the whole thing here on game day.